Chaminade High School’s “Advancing the Mission” initiative is aimed to improve academics by upgrading the campus facilities. The chief aim of this initiative is to encourage student involvement and interest in STEM education. 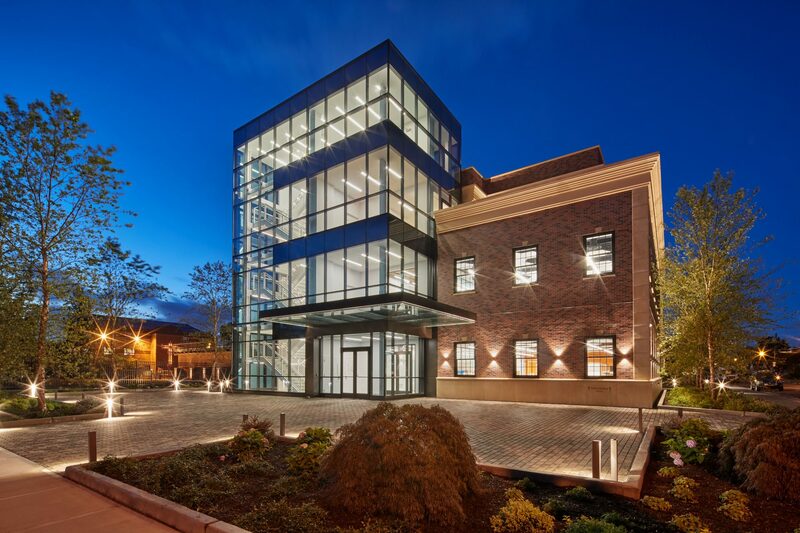 Mancini recently completed the design and ground-up construction of the new Dolan Family Science, Technology, and Research Center. 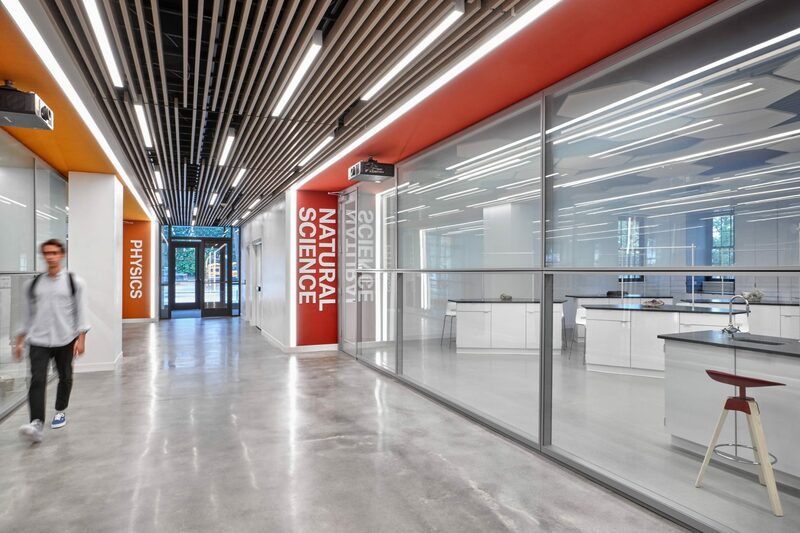 The design approach was focused on setting the stage for science and innovation, engaging students, faculty, staff and visitors at every turn. 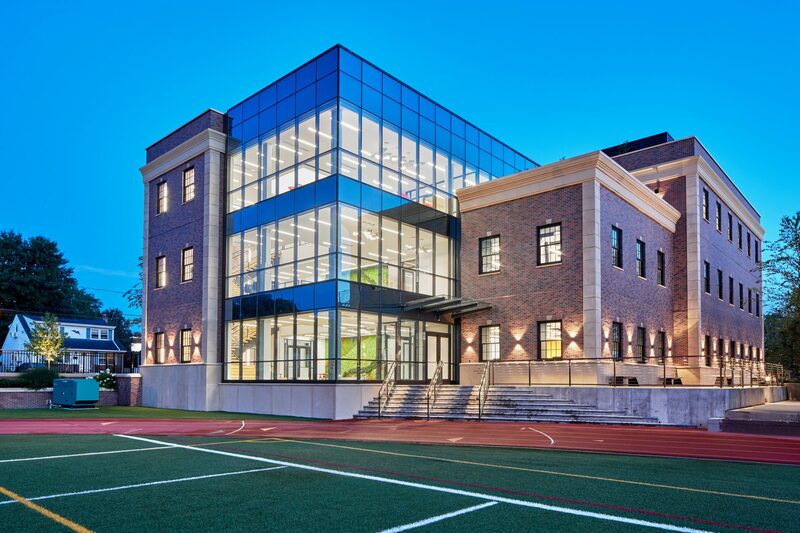 The three-story building communicates a sense of unity with the historic Chaminade campus yet stands out with sleek glass curtain walls. 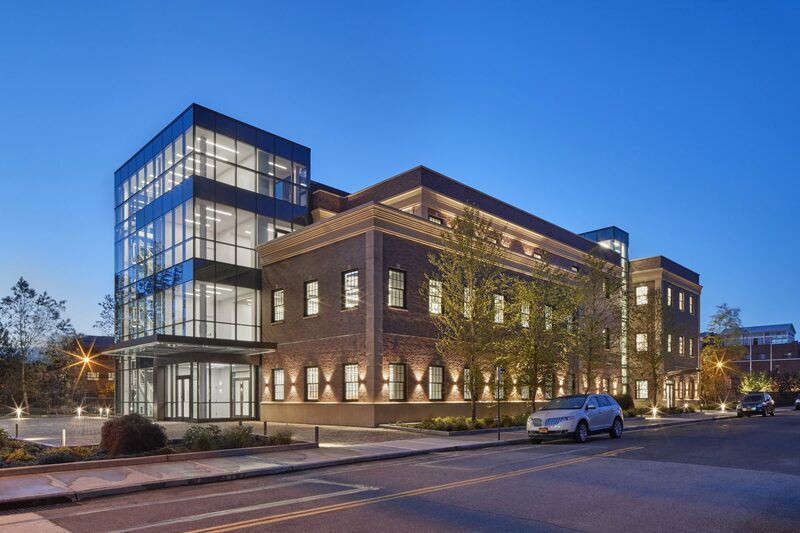 The brick and glass façade evokes the school’s modern present while acknowledging its historic past, maintaining the look and feel of the high school’s main building and hinting at the bold blend of ideas and technology within. 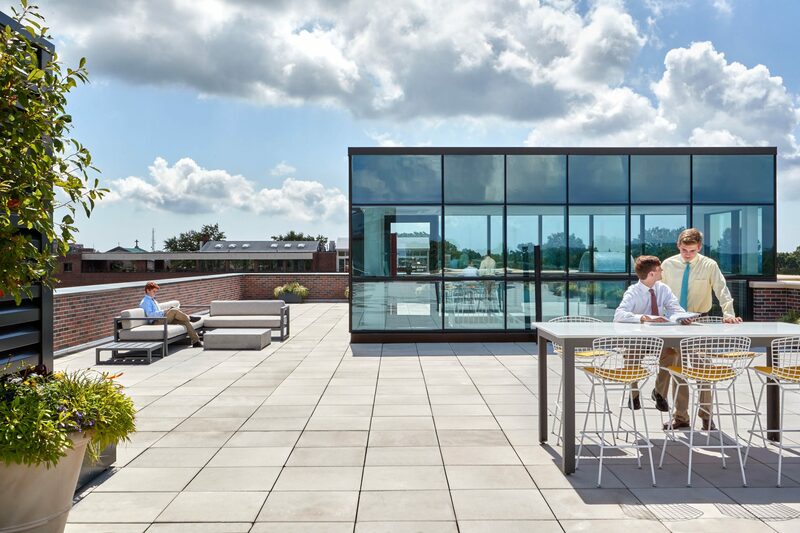 Spread across the Center’s 34,000 sf are six university-grade educational labs, zones for collaborative discussion and a multipurpose floor with access to terraces and a roof deck for meteorological observation. 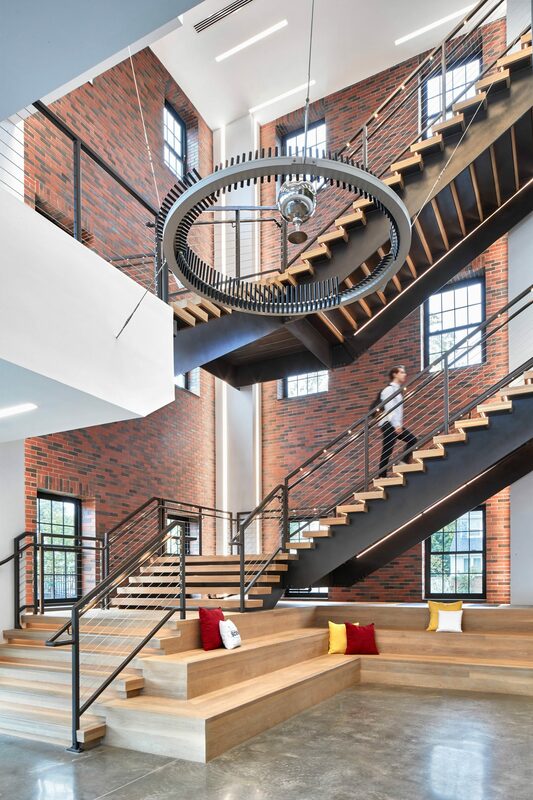 These spaces are all connected by a three-floor entrance atrium that is home to a Foucault pendulum, one of only six in the entire state of New York. 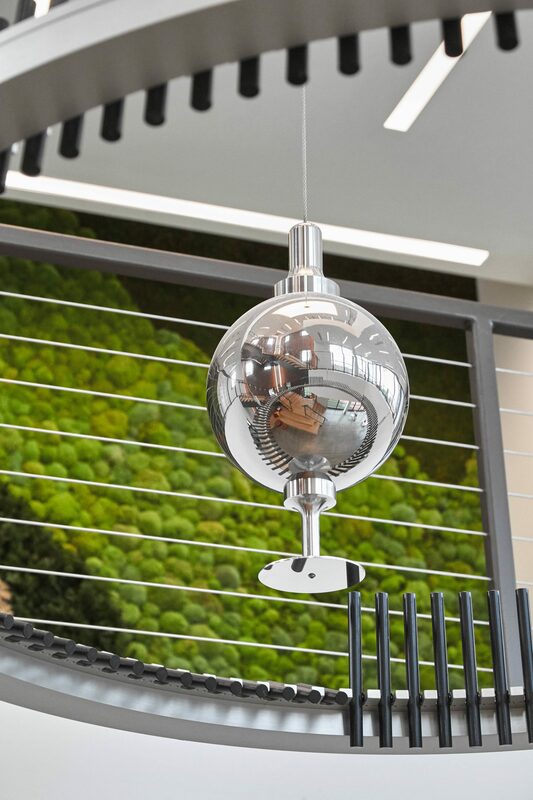 The pendulum demonstrates the rotation of the Earth and is an example of the “building as a teaching tool” design intent. A show-stopping grand staircase within the main atrium was designed with a unique structural support system that wasn’t bulky or overwhelming, integrating each component to act as one piece. The result is a light and airy staircase that complements the building’s design and supports the space as a destination. 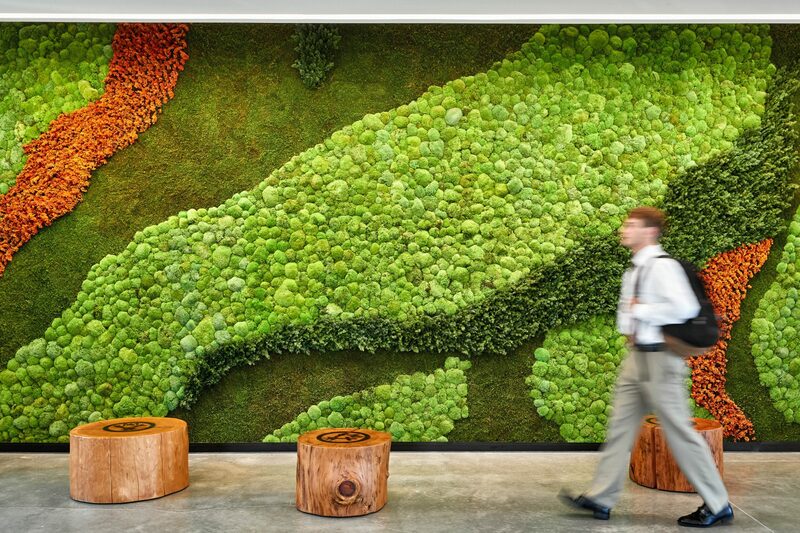 Another striking feature in the space is a vertical garden that climbs continuously up the height of the atrium. The plants that make up the vertical garden have been preserved so that maintenance can be kept to a minimum. Mancini designed this wall as a dynamic backdrop for transparent plaques featuring the names of the 945 donors that made the construction of the Center possible. 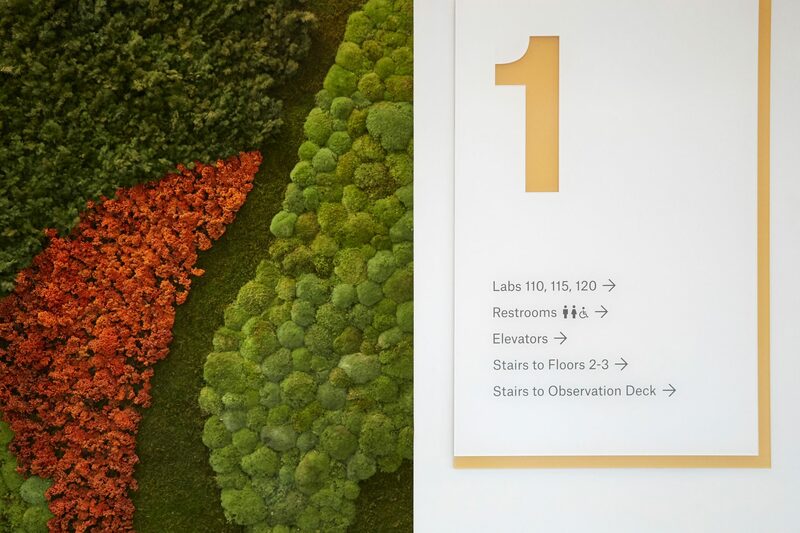 Within the main corridors, color is used to denote the different labs as well as wayfinding. 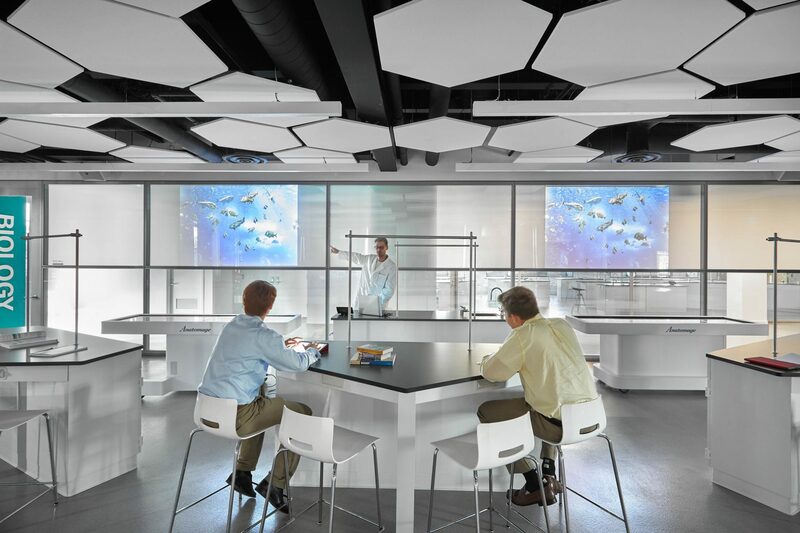 In every lab, an accent wall is a distinct color that stands out from the neutral palette of the rest of the building’s interiors. Combined with graphic signage throughout, it’s a striking visual cue for students. Idea spaces at each level capture the collaborative spirit of the students. 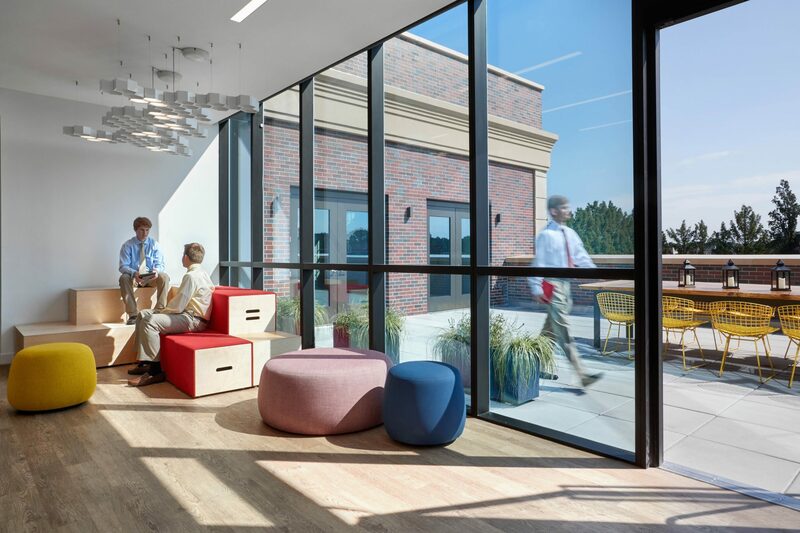 These zones feature playful furniture and design elements that are meant to foster creativity and interaction between students and teachers alike. 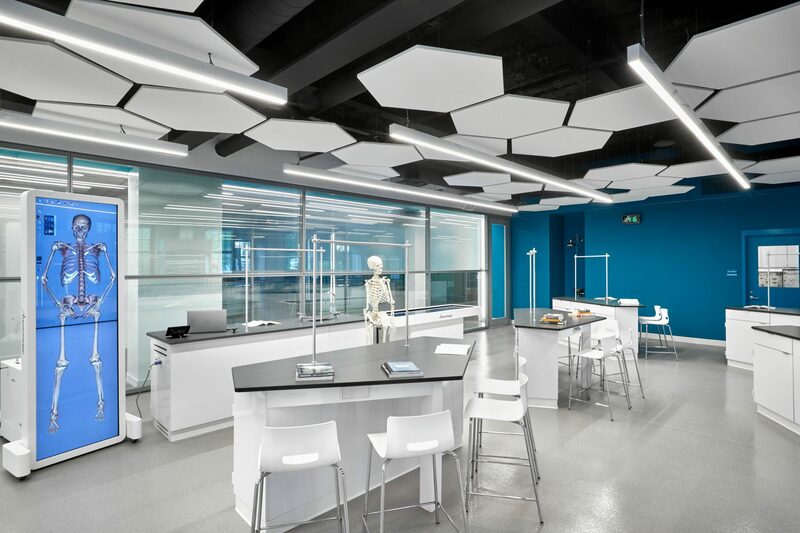 The individual science labs take education technology to the next level. A glazed wall runs the length of each lab, facing the main hallway, with a few panels serving a special purpose. These panels are comprised of electrified glass that transform into opaque backdrops for projection. Gone are the traditional whiteboards and drop-down screens: all the instructor has to do is press a button on the central technology hub station in the lab and the screens jump into action for the next lesson. 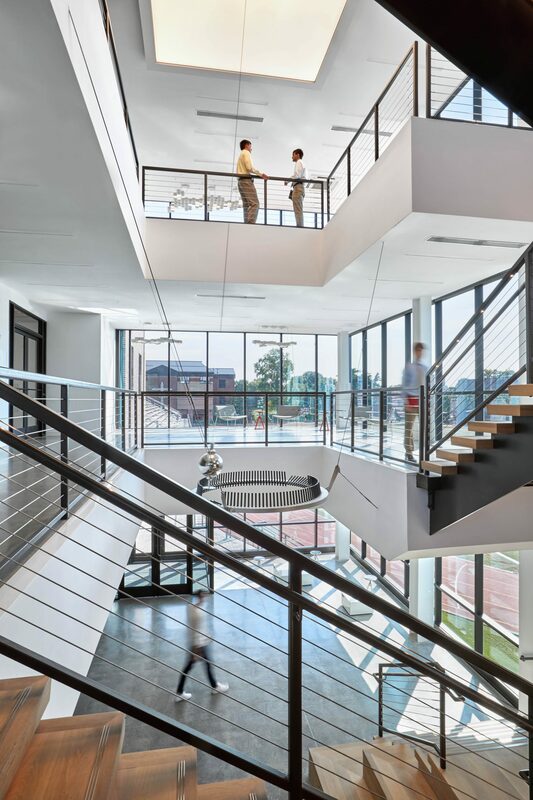 Mancini designed the building with the spatial flexibility to serve as an event venue for the school. 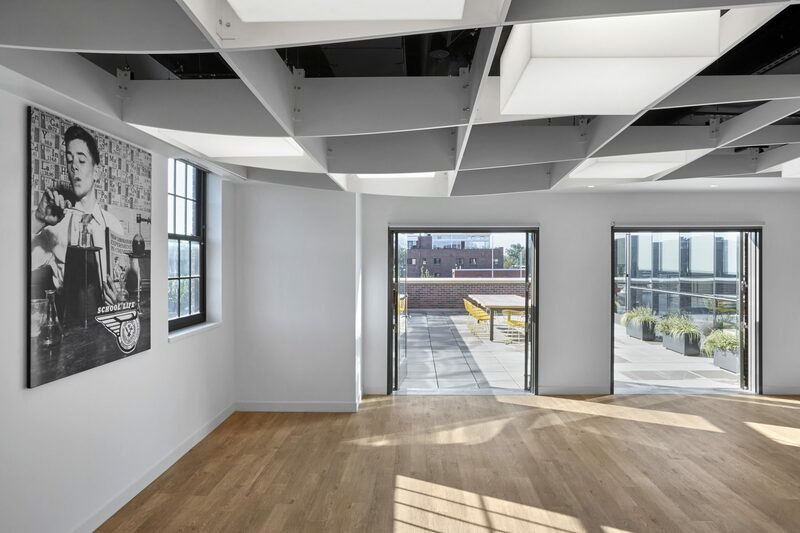 A third-floor multipurpose room, designed with an undulating, wave-like open millwork ceiling, is used to host fund raising events, school exhibitions, community functions and other events. Two terraces and access to a finished roof provide unique vantage points to look out over the football field to catch a game or even stargaze at night for an astronomy class. 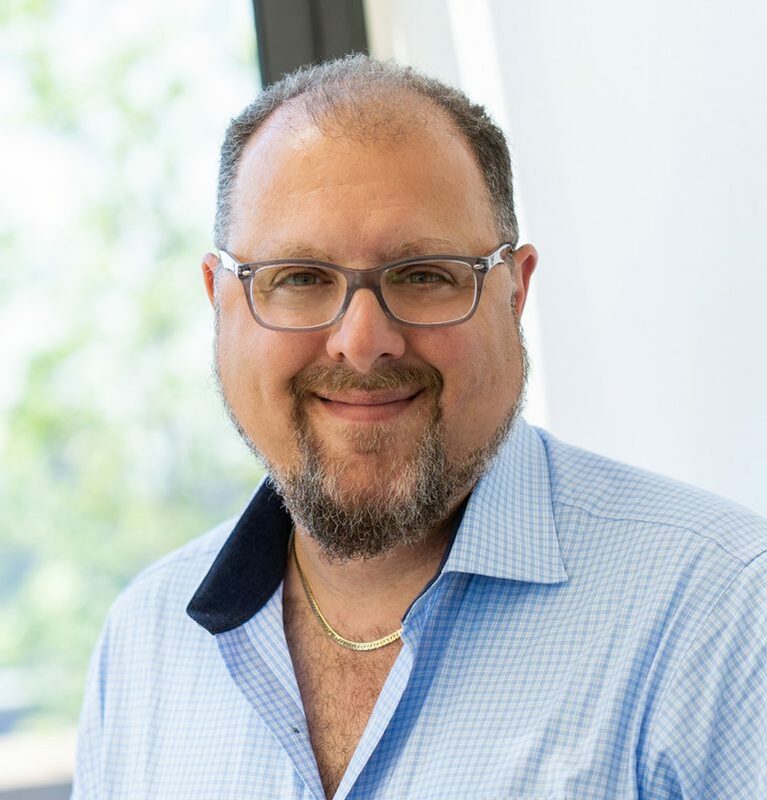 The Dolan Family Science, Technology, and Research Center also includes a 10,000-sf basement area, which is currently in development for future use.